Wondering how you are going to get your film out into the wild? Victor Zimet and Stephanie Silber had the same thought on their minds after winning the Best Documentary prize at the Westchester International Film Festival (back in 2007). Though they had a film festival win under their belts they couldn't land a distribution deal. The filmmakers told Studio Daily,"We went to the usual suspects, including HBO and Sundance Channel, and met with the same result as 99 percent of filmmakers, which is "thanks, but we're not interested" says Zimet. Rather than throw in the towel, Zimet and Silber decided to fight their way in with whatever techniques they could pick up along the way. "It has been an adventure, a struggle and a lot of effort with some positive results along a rocky road of rejection," he says. "We came out with a film each year for three years in a row," explains Zimet. "We realized we had to pull back from making films and instead figure out the distribution part of it. If we didn't do it, no one else was going to. We've made peace with that. I've actually gotten into it, though it's a real challenge to be successful." Studio Daily went on to describe how much of their effort centered around getting their film "Random Lunacy" into film festivals, building up favorable reviews and attracting people to the filmmakers' web site. These three things helped drive DVD sales. And that put the filmmakers on the verge of signing a distribution deal to sell their DVDs online through Amazon, Barnes & Noble and Best Buy. In the Studio Daily article the filmmakers insisted that the first thing you have to do is overcome your fear of rejection. "For every film festival we get into, we're probably rejected by four," says Zimet. "For every critic we write to try and get a review, most don't write us back." At first the rejections can be overwhelming, but the more you do it, the more you take it in stride. "Today we wrote to a sailing magazine because our main character sailed the Atlantic on a raft made of junk," he says. "Another film site has had our film for a while, and I was wondering when the review is going to show up. Every day, it's what baby steps can we take to keep moving this along." Zimet recommends two Web sites for independents looking to promote their films or videos. The first is Film Specific. "It's run by Stacey Parks, who has a lot of experience on the distribution and marketing side of the business, but is totally accessible to people trying to fight their way into the marketplace," he explains. The second is Brave New Theaters. "Through that, we got an art house in Indiana to play the film for a night," he says. "Through word of mouth, the film played a night at another art house in Phoenix." The downside to one-night stands is getting press coverage. "The newspapers aren't interested if it's a one night thing," he says. In that situation, Zimet and Silber will often work directly with the theater owner, who might publicize the screening through an e-mail list. 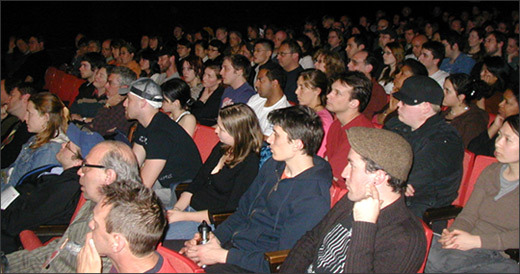 Don't assume a traditional theatrical run is the ultimate goal for a successful independent production. "Having done a lot of research over the past year or two, I found out that theatrical runs exist basically to sink money into advertising to help support your eventual DVD release," he explains. "Very few independents actually make money that way." Zimet and Silber are using Film Baby for fulfillment. "We ship the DVDs to Film Baby, and people order the film through our Web site," he says. "Film Baby collects the money, ships the DVD and takes out four bucks for the sale." Zimet and Silber had artists design the cover, and they order 500 or 1,000 discs at a time from Disc Makers. "The DVD looks exactly like a studio release," he adds. The Random Lunacy DVD sells for $19.99. How are the sales going? "We're not selling a ton of DVDs," says Zimet. "On the other hand, we're selling them worldwide. Every day, we go online and check the store to see where people have bought from." Another method for DVD distribution involves disc-on-demand manufacturing. CustomFlix, co-founded by Dana LoPiccolo-Giles back in 2002, was created to introduce just-in-time manufacturing to the indie film business. Amazon purchased the company in 2005 and relaunched it as CreateSpace, though the mission has remained essentially the same. "We felt that there weren?t a lot of options for filmmakers trying to monetize their work," explains LoPiccolo-Giles. "Traditional distribution works great for certain applications, but it's not a great solution for the independent filmmaker." With CreateSpace, your video is uploaded to Amazon.com and listed as a regular title. "We store everything on servers, and it's produced just-in-time for each customer order," says LoPiccolo-Giles. "No inventory is involved, so there are no upfront costs for the filmmaker. There's no risk. If the thing doesn't sell, you're not stuck with thousands of them sitting in your garage." At least the relationship is non-exclusive. You retain all rights and can leave the program at any time. "Historically, the creative community has been taken advantage of by traditional distribution and publication models," says LoPiccolo-Giles. "It was important to us that our members expand their reach, maintain control and keep their options open." 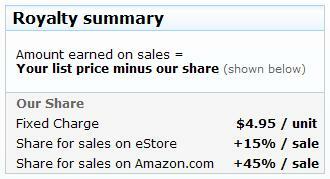 Every time a unit is sold, you pay Amazon a manufacturing fee. "There's also a percentage of the sales price, depending on the sales channel you've chosen to sell through. Importantly, the members set their own list price." While your DVD will be available to millions of Amazon customers, you'll still have to get the word out. "There's a common misconception in the filmmaking community that if you make it, they will come," says LoPiccolo-Giles. "That happens to some degree, but the people who are most successful using this service will go out and promote it. They might use Google AdWords or form strategic partnerships. Some of our filmmakers have gotten really creative in how they drive up awareness." One of the success stories is the 2006 hockey documentary, In the Crease. It has grossed more than $500,000, with most of the revenue passing through CreateSpace. "For a while, it was Amazon's bestselling sports DVD," says LoPiccolo-Giles. The filmmakers Matt Gannon and Michael Sarner swapped a promo on the DVD for access to the National Hockey League's e-mail list. They also ran an ad in USA Hockey Magazine and reached out to newspapers, equipment suppliers and even small, independent sports shops. YouTube is another viable distribution channel, especially now that it has added the option, like Vimeo before it and most recently Facebook, to stream in 720p HD. With YouTube, however, you?re limited by length (10 minutes max) and you'll still have to compete with millions of other clips. A better option may be to stream the video from your own Web site, but pay a specialized company to host the video. Fliqz charges a monthly fee for its services. Its customers include independent filmmakers, the Mill Valley Film Festival and The Film Arts Foundation. "Everything that we do is package priced," says Benjamin Wayne, CEO for Fliqz. "It starts at $99 a month, and it can go up to several thousand dollars a month for things we do for Major League Baseball or VH1." Most customers pay less than $200 a month for an end-to-end solution. "Many filmmakers don?t care about things like having the player branded in a particular look-and-feel, or having community features such as sharing or reposting, although for filmmakers who are interested in viral distribution, we do offer features that allow for the film to be reposted by others, shared by e-mail or offer rating capabilities." What advice does Wayne give filmmakers who want to put their video online, hoping for it to go viral? "Make sure that in editing and distributing a film online, you've done the things that make it appropriate for an online experience," he says. "Long shots are hard. Pans are hard. The frame size is much smaller, so take that into account." Also expect your audience to have a short attention span. "The typical consumption length is about 90 seconds," explains Wayne. "You tend to have significant drop off in viewership after that, so 90 seconds is the magic length for people who want to do clips from a feature film." Otherwise only a minority of viewers will make it to the end of your clip. Fliqz tracks each online viewing experience and issues reports on when viewers abandon a clip. "We can help filmmakers figure out how to tune their clips based on viewer behavior." Whether these techniques will work for you may depend on whether you see the glass as half full or half empty. "Everything we do brings a little bit of success," says Home Team Productions' Zimet. "If we try this, and it's not as great a success as we thought it was going to be, I still think there's something in it that did succeed. I'll take it for that in my most positive moments, and just say, OK, let's move on." (Editor's analysis: So how do you convince an audience that's become accustomed to free video to nonetheless pay for your video? That's the question that keeps studio execs up at night. The approach championed by Zimet and Silber in the Studio Daily article (using internet exposure to drive DVD sales) is a good short-term solution. It works because consumers are still willing to pay for a physical disc, however online video is quickly putting an end to that notion. This year alone DVD sales are down 13.5%; it's only a matter of time before the DVD business evaporates altogether.